This exhibition explores multiple ways in which medieval and early modern objects communicated both sacred and secular messages to their viewers. By re-thinking scholars' traditional division of medieval and early modern objects into secular and sacred categories and by examining the history of this categorization, the exhibition shows visitors (in the wall texts, labels, audio guide and catalogue) how to decode these images, thereby revealing how lines between the two categories blur for each object displayed. Conceived in 2002 as a collaboration among three local institutions, Boston College, the Museum of Fine Arts, and the Boston Public Library, this exhibition has been planned to coincide with the annual meetings in Boston of the Medieval Academy of America (March 29-April 1, 2006) and the College Art Association (February 23-26, 2006). Comprising almost one hundred objects (illuminated manuscripts, tapestries, silks, sculpture, metalwork, paintings, ceramics and early illustrated books), Secular/Sacred takes an inventive and interdisciplinary approach to the study of the style, subject matter, functions, and reception of works of art from the eleventh through the sixteenth century. The illustrated catalog, edited by Nancy Netzer, published by the McMullen Museum, and distributed by the University of Chicago Press, includes thirteen essays by the exhibition's co-curators: Pamela Berger, Sheila S. Blair, Jonathan M. Bloom, Matilda Tomaryn Bruckner, Michael Connolly, Lisa Fagin Davis, Patricia Deleeuw, Robin Fleming, Earle A. Havens, Stephanie C. Leone, Nancy Netzer, Virginia Reinburg, and Laurie Shepard. The splendid Samson and Lion Aquamanile and Fox Spoon serve as centerpieces for this section comprising also eleven illuminated manuscripts with representations of various beasts. The section analyzes the interplay between text and image in the multiple representations of beasts from Yvain's lion and bestiary lore to Renart the Fox fables. 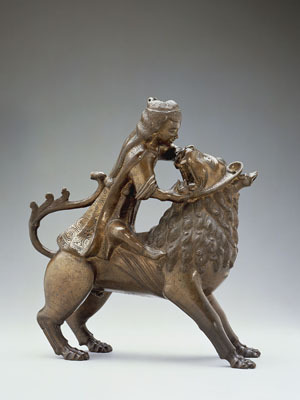 Beasts represented are shown to be signs of multiple stories with multiple (courtly, moralizing and religious) meanings, depending on their changing contexts, as readings of verbal and visual signs are invited, combined, and sometimes undermined. An array of paintings, official documents, manuscripts, seals and commemorative medals in this section both illustrate and complicate the prevailing medieval and Renaissance political philosophy of the “Two Swords”—a theory that defined, and sought to differentiate and isolate, the respective jurisdictions of sacred ministers of the Roman Catholic Church and "secular" magistrates, princes and kings. This section contains one of the showpieces of the exhibition, never before exhibited: a fully illustrated thirty-three-foot-long fifteenth-century French manuscript scroll, representing the history of the world through parallel genealogies of secular and sacred history—linking the kings of France directly to Adam and Jesus Christ—that is fully unrolled in a long specially-built case with interactive media. Lisa Davis, a co-curator of the exhibition, has recently uncovered the textual source of this and a group of related genealogical scrolls, which is revealed for the first time in the exhibition and in an essay in the catalogue. In this section Italian paintings, sculptures and manuscript illuminations of the fourteenth and fifteenth centuries have been chosen to reveal how Mary is portrayed in the late middle ages as a real woman, both in her traditional roles of mother of the infant Jesus and queen, and in roles depicted in western Christianity for the first time. Real women play many roles in the span of a lifetime, and Mary in the late middle ages did as well. In the examples displayed she is a beautiful, often very worldly, mother of the infant Jesus, and a stylish, even seductive, queen. As Eve before her, she represents all women, and indeed, in some late medieval German depictions she was occasionally portrayed as the new Eve, a seated, beautiful woman holding an apple. She was also nonetheless a major actor in the life of her son, including as a witness to his suffering and death; in scenes of the crucifixion and in the pieta, the grief-stricken mother holding the lifeless body of her son across her lap, her attire and demeanor are sedate and modest. This section examines depictions of lives of children, adolescents, and young adults in manuscripts, wedding chests, and tapestries and the ways in which sacramental and secular rites of passage mark the progress of young people's maturation and integration into the community. Customs and religious practices related to baptism, marriage, and death receive special attention. This section also includes a series of tapestry fragments associated with the sacrament of the Eucharist, assembled and displayed here for the first time. The tapestries were commissioned by the nuns of the Ronceray convent for display in their church to the entire city of Angers (France) on the annual feast of Corpus Christi. Virginia Reinburg, a co-curator of the exhibition, interprets the provenance of these tapestries and decodes their iconography (in a catalogue essay) to reveal local and secular meanings that the Eucharist held in late medieval and Reformation France. This section discusses a group of devotional and liturgical books from the western and eastern Christian worlds. First is a selection of illustrated manuscripts and early printed books intended as spiritual guides and religious instruction for lay readers. These show the changing currents of European religious history in the late middle ages and Reformation period, and in addition suggest a widespread "devotional literacy" among lay people. Parallels are drawn between these illustrated books and devotional objects (a reliquary triptych, candlesticks, and a book pendant), personal possessions whose use in prayer entailed what Marcel Mauss called "an apprenticeship in gestural action that we all undergo." Second is a group of three late-medieval Armenian liturgical manuscripts. Their miniatures and colophons serve to illustrate the varying cultic roles of service books, the additional secular meaning they acquire by being taken " prisoner" and held for ransom by non-Christian invaders, and consistent interaction of secular and ecclesiastical forces in the Armenian religious experience. The concluding section of Secular/Sacred examines functional objects as well as depictions of “secular” scenes dealing with commerce and luxury goods. Beginning in the eleventh century a new economy centering around coinage, commerce, and the banking trade began to develop and came to dominate the secular life of the later middle ages. In a Romanesque sculpture personifying avarice and manuscript illuminations this section examines the new iconography spawned by this commercial economy. The prominence of the Gospel scene of Christ’s Purification of the Temple and visions of the Last Judgment, where greed is amongst the sins most harshly punished, take on additional meanings as criticisms of the accumulation of wealth. A second area of this section focuses on textiles and jewelry to show how piety and status came to reinforce one another and how the symbols of one became the symbols of the other. Aristocratic displays of status were shaped in important ways by the religious practices of monks while at the same time spiritual displays of professional religious (along with some of the iconography they deployed) were transformed by habits of aristocratic status display. The section also shows how textiles, in some ways, moved in the opposite direction. The aristocracy’s lavish use of textiles was enthusiastically imported into religious life both by laypeople and by professional religious: saints can be identified in several manuscripts by their brocade-banded costumes; bishops were buried in cloth-of-gold copes, and pious Christians, who went humbly to their graves in shrouds, were sometimes buried in winding cloths made from rare Byzantine or Arab silk. Piety could thus be marked, even symbolized by extravagance. The final area of this section examines works produced in the Islamic world. Made as accouterments for the good life, these textiles and ceramics which the wealthy and powerful enjoyed in the Islamic lands, paradoxically took on new meanings when they reached Europe, as trophies, gifts, or trade-goods, in association with Christian practices and as reliquaries for the remains of Christian saints.